Are you looking for the best drill press in the market? Well, with the wide variety of these machines available, one can easily get confused picking the right tool. What makes the situation even worse is that all models from various manufacturers come with a pack of promises. But, do they deliver what they promise? Not all of them meet your expectation. This is why you need to be extra keen when buying any drilling machine. How about some little help? It will be great, right? In this review, I will be taking you through everything you need to know about Dewalt DWE1622k drill to help you make a decision. If you need a magic drill press, then read on to discover why this machine might be your ultimate choice. With that said, let get started! • Quick change chuck system; allows you to easily switch the inch keyed chuck and the 3/4inch Weldon shank. • 10 Amp Motor designed with 2-Speed settings; delivers outstanding performance in different uses. • Magnetic coolant bottle; you can place it on a work surface or either side of the tool to give various tool orientations. • Overload Protection electronics; secures the motor from excess accessory wear and damage. • 4-3/8” drill travel; delivers maximum capacity for heavy duty applications. • Quick release feed handles; enables you to change the handles to any of its sides easily. If you have been using drilling machines for a while, then you have definitely heard about Dewalt. Dewalt is among the best manufacturers who have been in the industry and have amassed a wealth of experience; they know what you need. 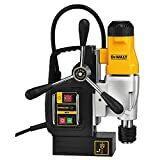 All their devices are designed with top-notch features that enable them to work with great efficiency and this Dewalt magnetic drill press is not an exception. It is a powerful tool that makes all your drilling exercises much easier. Despite the fact that there are other top manufactures of drilling machines, products from Dewalt remain unmatched. This is due to the high level of engineering and research invested in their production. The tools are normally designed with innovative onboard storage that allows you to keep various components and also enables you to access parts that need regular services easily. Considering the quality of products that Dewalt manufactures, it is clear that the Dewalt DWE1622K stands above the pack as one of the best magnetic drill presses you can find in the market today. If you still have doubts, read this review, and you will agree with me. However, if you need a drill tool that will serve you for years, then you need to be ready to invest a good amount of money, after all this tool is worth every cent. The DEWALT DWE1622K Magnetic Drill Press is built with a 10.0 Amp Powerful Motor that enables it to perform excellently. If you are working on heavy-duty workloads then you need a powerful tool; this tool will never fail you. even though a majority of the drilling machines in the market lack enough power for professional drilling, the Dewalt DWE 1622K is an exception as it gives you one of the best Dewalt drill you can get. I can assure you that satisfaction is guaranteed with its powerful 10 amp motor. It can drill any material including the hardest metal without experiencing any challenges. The machine enables you to drill through thick materials using little effort. This enhances your confidence in tackling any workload with guaranteed success. Its different speed setting enables you to use the tool for various purposes. The Dewalt DWE 1622K allows you to switch the speed to either 450 or 300 rotations per minute. Considering the fact that controlling the machines is easy plus its enhanced accuracy, no need to worry about the nature of the material to be processed. It works perfectly with various types of materials. Even though the speed settings are limited to only two options, the machine works efficiently. If you have dealt with heavy workloads before then, you must have realized that one of the biggest challenges that you encounter is overheating. This is due to the continuous use of the drilling machine for long and if it is not protected then you could end up getting it burned. Unlike other drilling tools, the Dewalt magnetic drill press is designed with an overheat protection system. So, even when using the machine to drill heavy workload, it will remain the same. If you own a workshop, then this is one of the best Dewalt drill to have. Away from the quality of its components, the tool is designed with long-lasting materials with exceptional quality. The machine is built with durability in mind to enable you solve your drilling challenges permanently. This means that you can enjoy an easy time handling various projects for a long time. Its design is also amazing with a compact size. I particularly like its lightweight and sleek outline which makes it portable with an attractive look. The compact size enables you to store it without consuming much of your space. Despite its small size, what this machine can accomplish is remarkable. It can drill through even the toughest materials without much struggle. The drill that this tool is constructed with can travel up to 4” enabling you to process thick metals with ease. Additionally, changing the chuck system is pretty simple and will take you a few minutes. The fact that you don’t need any extra tools to change the chuck makes this tool outstanding. Are you a beginner? Don’t panic; the tool comes with an easy to understand user manual which makes using it simple. • The drill can travel 4 inches to drill through thick materials. • Using the tool is pretty easy. • Comes with enhanced safety provided by its overheat protection system. • Built with powerful 10.0 amp motor for excellent performance. • The tool is constructed to last long. • Has a compact and sleek design for easy storage. • The speed stings are limited to only two options. • Some people might not afford its high price. If you need a machine that is reliable and performs excellently, then you will be satisfied with what the Dewalt DWE 1622K magnetic drill press can do. The machine is also designed with quality features and a durable body construction to ensure that it remains functional for a long time. It allows you to carry on professional drilling in an efficient way and any other workshop projects. So, even if you will be handling tough or tick materials, this tool will work perfectly. If you can afford to have this tool, then you can rest assured that your drilling tasks are about to become a lot easier.